As a veterinarian, I see a lot of chronic diseases such as diabetes, cancer, obesity and skin conditions in dogs. I practice Eastern and Western integrated medicine in my practice and Eastern Medicine places a lot of importance on fresh foods as a part of Food Therapy. Cooked meat, unprocessed carbohydrates and cooked vegetables. We can use Traditional Chinese Medicine to choose which ingredient based on either a specific disease pattern or based on the animal’s Element- their propensity toward imbalance. although the majority of my patients are in a processed, dry “kibble” diet. I think Eastern Medicine may be able to teach us a better way. I have practiced acupuncture and herbal therapies for years, but it wasn’t until I started recommending fresh food diets based on Eastern Medicine’s Food Therapy, that I saw such an improvement in every patient. The change in my patients when we began feeding them a real, fresh food diet- was amazing! Freshly cooked, quality ingredient diets prevent chronic disease and cancer. It’s been shown over and over again in humans. But we stop short of suggesting this in dogs. What makes Fresh Real Food and an Eastern Medicine approach so powerful? Antioxidants prevent cancer by neutralizing free radicals that damage cells. We give supplements to dogs sometimes for this effect, but why not use the most natural source? 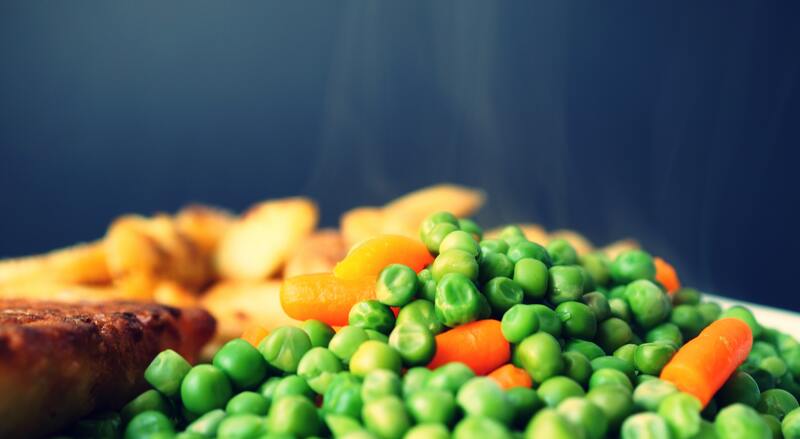 Foods with bright colors like dark green, orange and red, such as spinach, sweet potato and carrots have more antioxidants than bland colored foods. We get high amounts of natural antioxidants from clean, colorful diets of real foods. Glycemic index is a measure of how fast a carbohydrate turns into sugar in the blood. Processed dry dog food has anywhere from 40 to 60% carbohydrates, usually the starchy portion which is easily broken down in the digestive tract. Carbohydrates are not the enemy, but high concentrations of highly processed, (think cornmeal, flour) carbohydrates allow sugars to spike and increases risks of cancers and diabetes. We often see cats and dogs become Diabetic in our hospital and the standard Western Medicine recommendation is to put those animals on a canned diet- because it’s is lower in glycemic index. But for years these animals are eating high glycemic index, proceeded dry foods? That can’t be wise. Eastern Medicine contends 1/3 of a dog’s diet should be a cooked, unrefined carbohydrate like barley, oats, brown rice. This is not the same as a processed or a high glycemic index carbohydrate. An unprocessed ancient grain is gentle on the stomach and is nutrient dense. Home cooking meals is the best option- for all of us. You can rotate ingredients and you know the quality of the ingredients you are using. (you would think twice if you say the poor quality ingredients that is ok to put in commercial dog food at pet food factories). home cooking 1/2 of your dog’s meals and feeding a balanced whole food diet like Chi Dog. Feeding 100% Chi Dog or another whole food diet made with real human grade ingredients. If the above is not possible I suggest adding some healthy leftovers into your dog’s bowl. Clients are often surprised when I recommend they feed their dog left over human food.I always say, “if it’s good enough for your kids, it’s good enough for your dog!” Please consult with your veterinarian if you are concerned about specific foods and always avoid grapes and raisons. To learn more about how to home cook for your dog, schedule an appointment with a TCVM (Traditional Chinese Veterinary Medicine) practitioner who practices Food Therapy or check out our Home Cooking Blog.